These are some common definitions associated with the basic thermodynamics. every thermodynamic study and analysis is related to these terms. let's get a quick review of these terms. thermodynamic system is the place which contains a certain quantity of matter in which thermodynamic processes happen and thermodynamic analysis can be carried out. in the system, the matter will consist of certain properties which can be altered by different processes like transfer of mass and energy. Everything external to the system i.e. 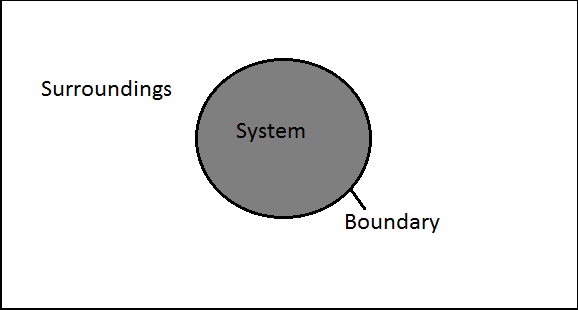 the outside environment is called surrounding to the system. Boundary is something which separates the system and the surroundings. the boundary can be real or imaginary. sometimes a relative boundary is considered so the boundary can be at rest or in a motion. The combination of system and surroundings is called Universe i.e. when both system and the surroundings are kept together they can be referred as the universe. Open Systems are those in which both Mass and Energy can be inserted and can be taken out of it. This system is open to any intersection of mass and energy. Closed system is one in which mass remains constant i.e. mass cannot be added or subtracted but energy can be manipulated. Isolated System is one in which mass and energy both can neither be added nor be subtracted from the system.